Well there’s nothing growing on them (yet… stay tuned…) but this table and octahedron, built of entirely reclaimed materials made an appearance this weekend at the California Gift Show as part of the booth for Looptworks, a Portland, Oregon based startup that has recently been featured in Fast Company and Entrepreneur magazines (Click on the links for the articles). 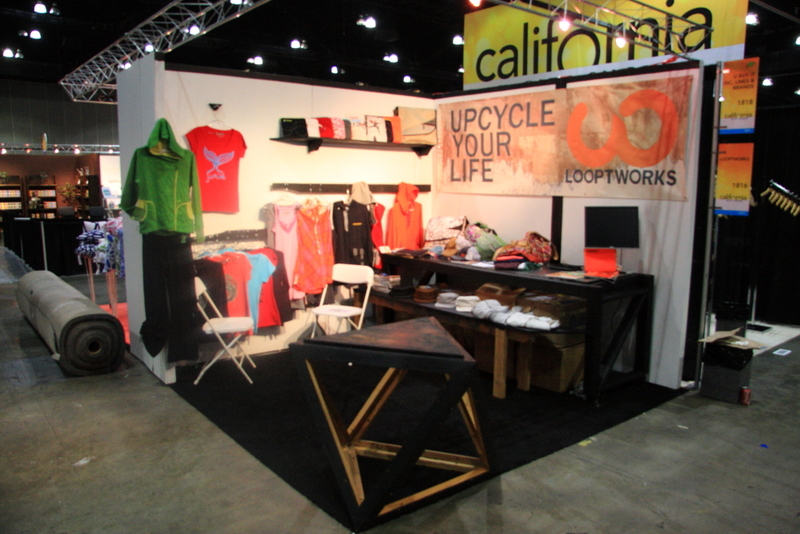 Looptworks specializes in limited runs of stylish clothing and other accessories such as iPad and laptop bags made from “upcycled” materials – scrap fabrics that would otherwise be thrown away by textile manufacturers. 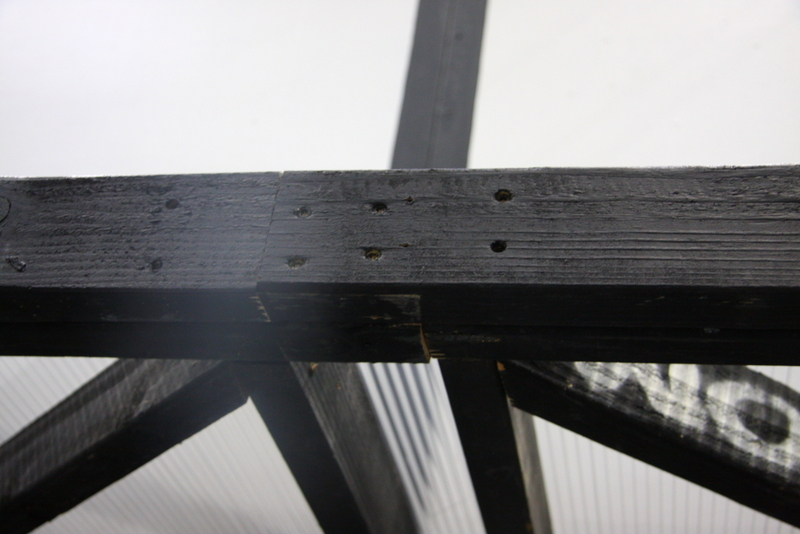 As the photos attest we also included displays for their presentation that were entirely improvised from scrap palettes and plywood dumped in a Midtown LA parking lot – it’s amazing what a bit of paint and style can do. 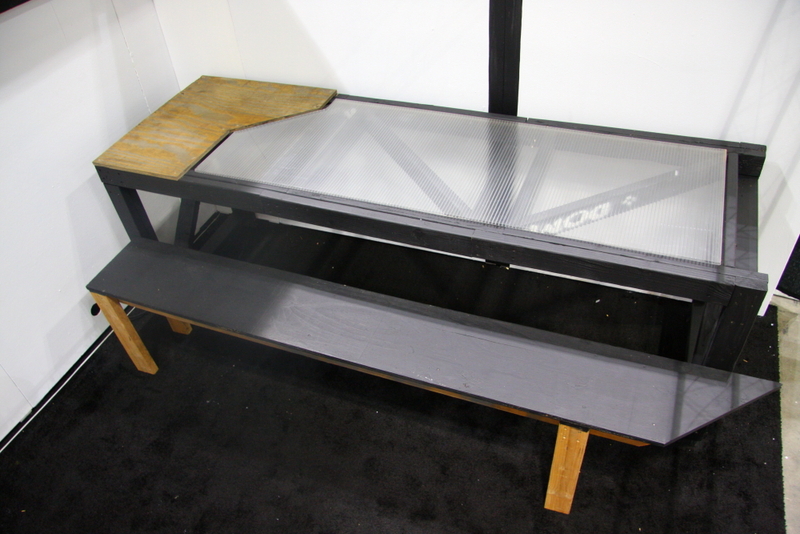 After a hump-day all-nighter building the table I met up with Scott Hamlin and Kiana Neal, who commissioned the design and flew down to represent Looptworks at the Gift Show. 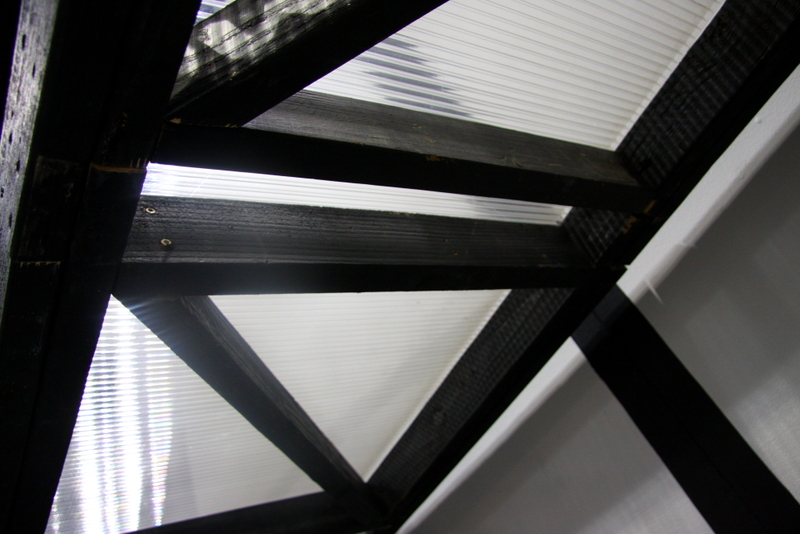 We then spent most of a tired but fun Thursday installing at the Los Angeles Convention Center. 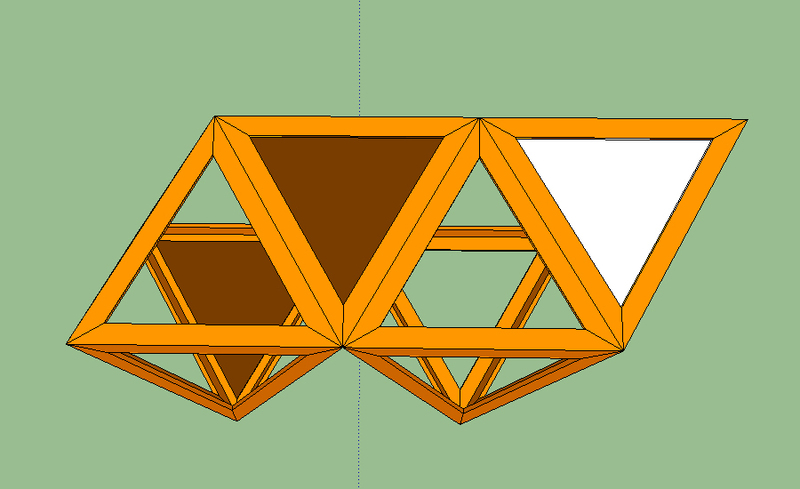 The table and octahedron are entirely modular. 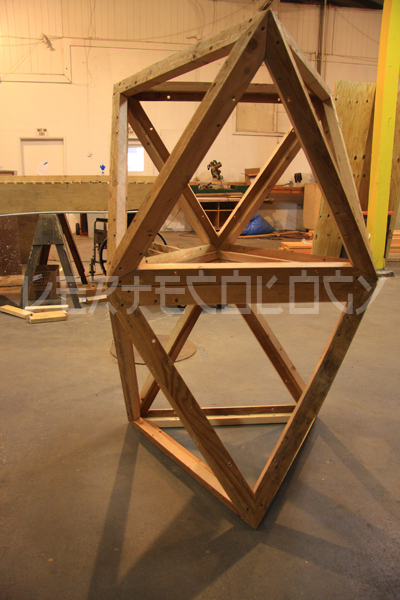 The table is constructed from a single repeating wooden form that can be modified slightly with each iteration and positioned either to become part of the top or one of the side supports, and that when put together form a solid truss. The frame was made from reclaimed Douglas Fir 2×4’s that were originally used by a photographer friend for another display, and we decided to leave a few traces of the text she painted on the wood for a little taste of the materials’ history and a stylish flair further enhanced by artful cuts and gaps on the plywood and scrap corrugated plastic tabletop. 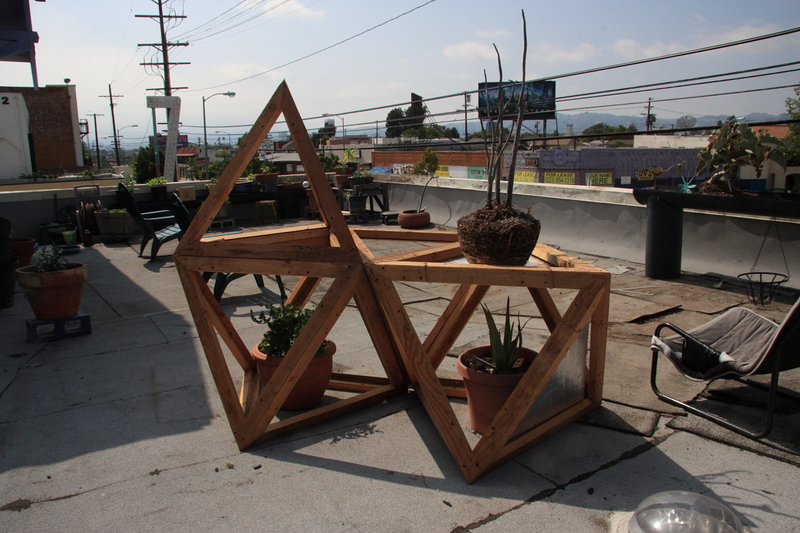 The octahedron, also of reclaimed Douglas Fir mostly purchased from Jose Nunez & Son scrap yard in East LA (2×4’s for $1 a piece if you’re willing to pull the nails), is also part of a repeating system, one that can be adapted as a multifunctional garden system – individual octahedron/tetrahedron elements such as this one can be stacked, bolted together, individual units being left open, partially or wholly enclosed, with each unit taking on one or more ecological x structural x happy-people functions, pretty much limited only by imagination. Check the photo below. 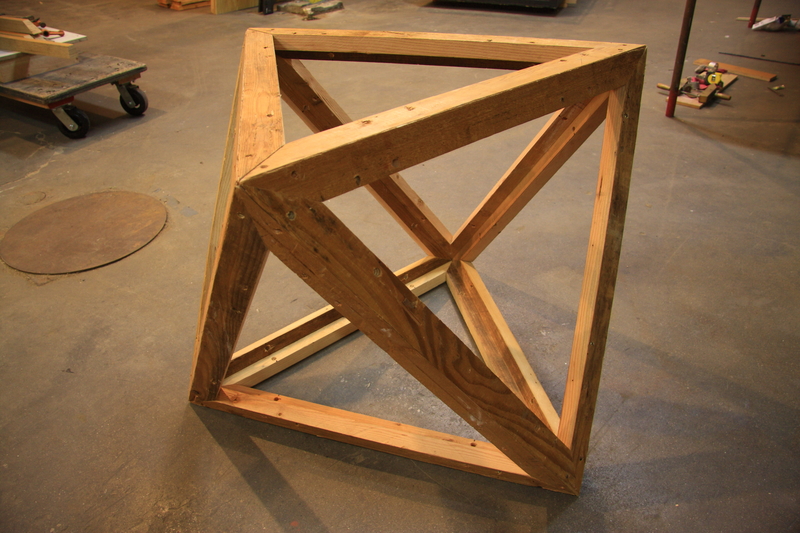 Posted on July 26, 2011, in Installs and tagged build, california, clothing, custom, design, douglas, ecology, fir, gift, install, loop, looptworks, modular, octahedron, octet, permaculture, plastic, product, reclaimed, repeating, scrap, show, table, trade, truss, vertecology, wood, works. Bookmark the permalink. Leave a comment.